The quaint village of Rhinebeck in the scenic Hudson Vallery, NY is my home with my Bragg Hollow Studio a few steps off the main street. In the summer I am often found outside, en plein air, painting those familiar subjects that we all know but have ceased to notice because we see them every day. With my painter’s eye I am constantly looking for shapes, angles, light effects, and interesting lines that take the landscape beyond the ordinary. When painting is not possible I open my sketch book and draw: figures, landscape, whatever catches my eye. These sketches are taken into the studio, combined and developed into large oil paintings of the activity I have just witnessed. While reflecting man’s use of space, often a series of my paintings develop into a community of tangential spaces with a strong sense of the history of human endeavor. I am drawn to the American vernacular architecture and landscape that have been arranged by man’s activity. 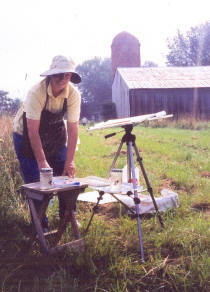 Although people are seldom included in my plein air paintings, they are often the focus of the paintings created in the studio. I paint quickly with broad strokes with only passing attention to detail. My subjects are transformed by light and the paintings are expressive, full of high key color, and emotional. I react quickly using large brushes or palette knives. Soft edges outnumber hard; paint is rarely layered and there are few special effects. The result is vivid and striking paintings that appear to be effortlessly created. “Another October Day in the Catskills”, watercolor chosen for the cover of Arts & Culture in the Central Catskills, Catskill Mountain Scenic Byway Audio Guide, 2017. http://www.sceniccatskills.com. Travis teaches her brand of liquid, active, alla prima watercolor in small, weekly sessions, from her studio.